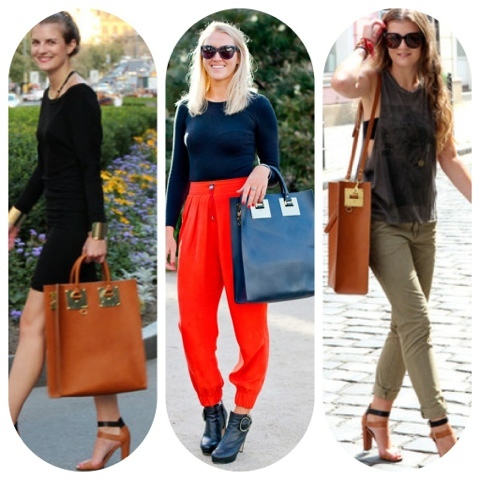 New Designer Alert – Bag Crush! 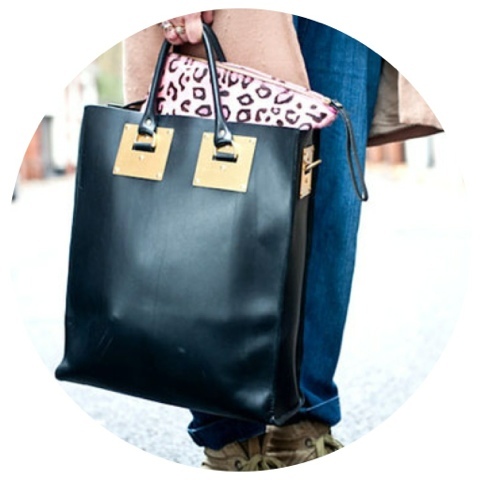 Been gushing over the Sophie Hulme totes. With it’s tall slender rectangular built this bag was made for the working lady. Large enough to carry a lady’s every need for her nine to five, yet it can easily be taken into the night. Gold plated detailing adorn all four corners adding to the sophistication. A lady with a sense of class need only apply. You would think Karl Lagerfeld has visited everywhere right! Well Mr. Lagerfeld made his first trip to a grocery store. Yes a grocery store! “It’s the first time I’ve stepped into a supermarket. It’s crazy — fascinating what one can buy. There’s enough here to easily gain 20 kilos,” he told Elle France. Wondering why the sudden burst of spontaneity? Well folks this is all for a magazine spread of course! Elle France that is! Can’t wait to see where else Karl is taken in the full spread. The Burberry woman is such a lady! Burberry’s CCO Christopher Bailey described the collection as “a little bit sassier, a little bit sexier, and a little bit more joyful”. Throughout the collection the Burberry woman finds a balance between covering up and showing off a bit here and there. The show opened up with structured cream cloaks. It went on displaying the classic trench revamped in rich metallics. Ruched and laced one piece swimwear worn under cropped cloaks continued the show. Corseted dresses, peplums and pencils completed the rest of the collection. As a whole the collection is very complimentary to the ss13 men’s collection. Power couple much! The collection was a hit! It was composed of slashed pencils layered over oversized shirts. The shirts featured fine feminine mesh detailing cut-out in blocks. There were patchwork pieces, some composed of python and some composed of lace fabric. Slouchy trouser suits in muted shades paired with bandus underneath. A statement was definitely made despite it’s understated luxury. 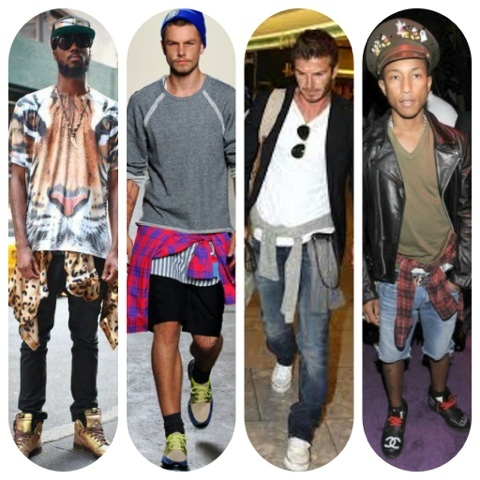 Since this past Spring and into the Fall/Winter season, the 90s trend is continuing it’s comeback. Much like many comeback trends, the shirt tied around the waist has a modern twist – in this case it’s a modern meaning. This trend is not gender specific in any way, quite popular with both the ladies and gents. 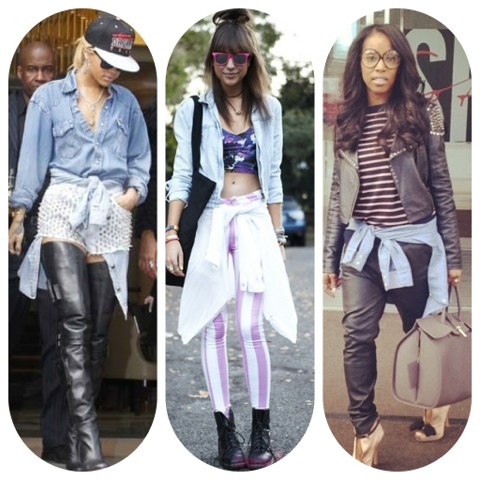 From chic fashionistas to the grunge dressing crowd, to the celebs – this trend is showing up across the board. There’s really no rules to wearing this trend – the most popular for the ladies is over boyfriend jeans with a tee. Take that up a notch and pair your jeans with some heels for a girly feel. Try pairing it with some cutoffs, tee and combats for that rebellious look. 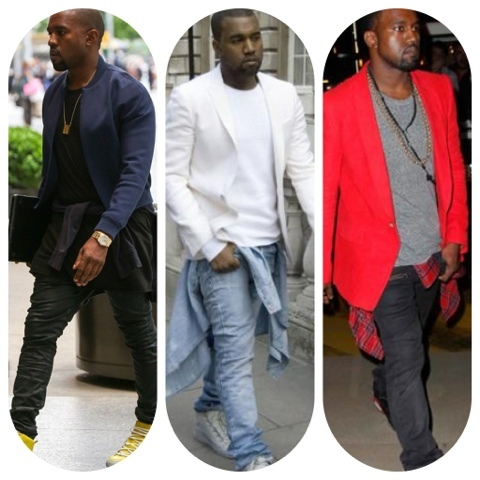 For the fellas it’s pretty much standard – jeans, shorts or sweats with a tee. Wishing to take this look in the night? Why not try a shirt in a more dressy fabric like satin, metallic or lace and pair that with a dress or skirt and kick on some pumps! For the fellas, tie yours over dress pants under a blazer using a dress shirt of course. It’s a fun relaxed youthful look, giving one that ‘it didn’t take me long to get dress today’ look. Try it! Michael Kors definitely had the best dressed couple on the runway. Much like the other shows, stripes ruled the runway. The looks were geometric glam and sixties mod with a lot of belted pieces. Drop waist dresses and skirts hung low. Bold primary colours complimented by black or white. Head-to-toe vertical stripe looks to horizontal stripe sweaters and midi skirts. 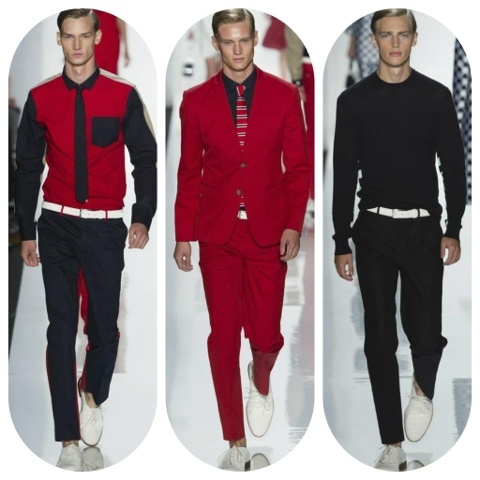 As for the fellas – they were perfectly paired with the ladies in sleek suits, sweater, pants or shorts combos in primary hues, vertical and horizontal stripes. Models’ hair were parted to the side to go along with the clean lines themes. The show concluded with halter gowns with perfectly placed keyhole cutouts. Rachel Roy made a collection fit for the working woman. 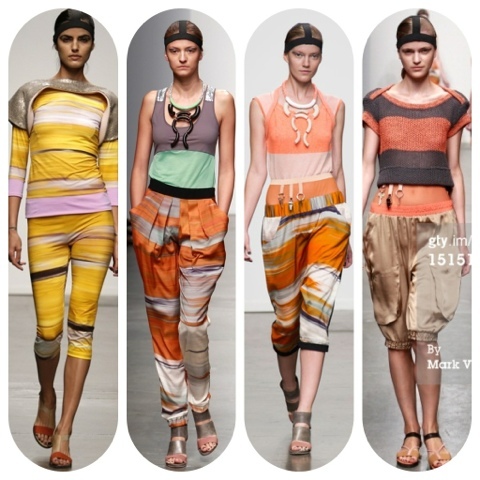 She delivered a great mix of neutrals, colours, separates, textures, patterns, prints – you name it! This collection is a definite must have for the office gals – mix and match this collection and you have yourself a Spring office wardrobe. Allows you to get creative and have fun switching up your looks, taking it from day to night. The pieces were no fuss and classic, fresh and age appropriate for daughter, mom and grandma. Tons of separates, from pant suits, sweaters, short suits, patterned blouses, dress shorts oh my! It’s all about the stripes for Marc Jacobs next season. I definitely feel a mod sixties theme here with the drop waist skirts, bouffant hair and psychedelic prints. The collection was filled with variation of the striped pattern: circus stripes, prisoner black and white and candy cane red and white. Later on the collection took a turn, rounding out the stripes into checkerboards, houndstooth and leopard spots. Shoes were kept flat or pointy kitten heels. The show then ended with models in drop waist maxis. It’s safe to say we got a glimpse into Marc’s mind. Obsessed with DKNY’s ss13 collection! Every piece is a must have! The collection was fresh, casual, cool and sporty urban – effortless and to perfection. It included denim paired with crisp whites with a pop of colour here and there. Some looks went down the catwalk with fanny packs – hinting a big return; possibly a new trend to hit store shelves next Spring maybe! 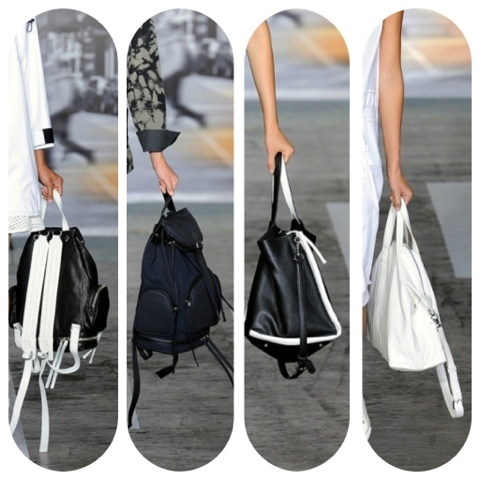 In addition to the fanny packs, slouchy totes and napsacs were offered in black and white colour block, which added to the sporty urban collection. Napsacs are sure getting chicer and chicer – perfect for the traveling fashionistas. Let’s not forget those bubble wedge boots. The sneaker trend has definitely been on the rise in high fashion – it looks to be continuing on into the warmer weather. Masculinity and performance fabrics were the frame work for the VPL collection. The collection is not shy of colour, but colours are soften and provides a more modern feel. In second skin fabric this woman is definitely not afraid to show it off.